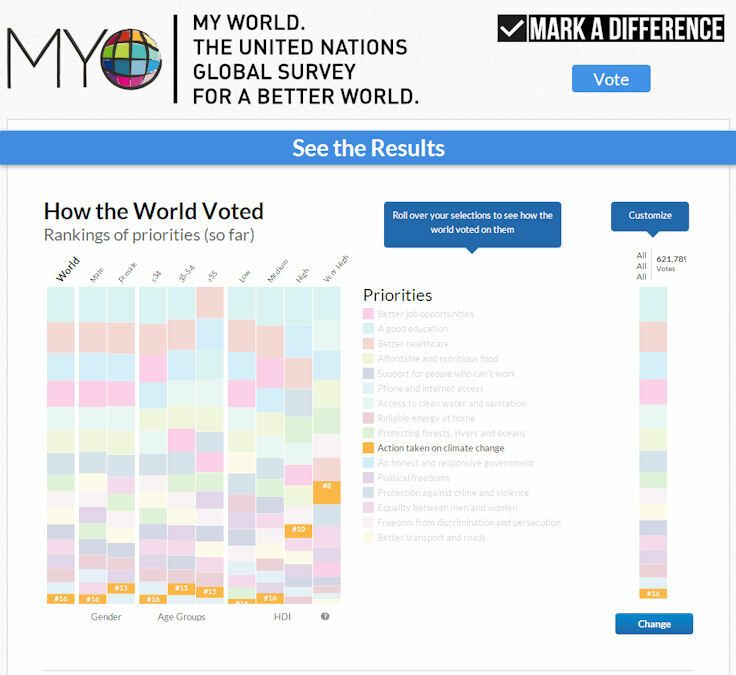 Back in March of this year, the United Nations Development Program (UNDP) announced an “innovative initiative” in which participants from around the world are invited to vote on what the priorities should be in a post-2015 world. People from around the world had an opportunity to join the global conversation to shape the future development agenda by participating in an innovative initiative known as MY World, Olav Kjørven, Assistant Secretary General and Director of the Bureau for Development Policy at the United Nations Development Programme (UNDP), said today at a Headquarters press conference. 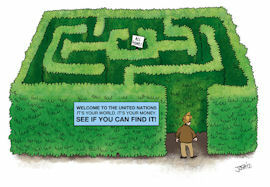 “There’s been something really important missing in the way we at the United Nations and at the global level have been deliberating and deciding on issues over the last decade, and that something has been you — people all over the world,” he told correspondents, adding that the era of making decisions about global issues behind closed doors with little citizen involvement was coming to an end. [Head of Growth at the Poverty and Inequality Programme at the Overseas Development Institute’s Claire] Melamed said MY World allowed people’s voices to be heard as they chose, in an interactive way, those issues that would make the most difference in their lives. Global citizens were being asked to vote on the six most important issues from a list of 16 options put together with the help of non-governmental organizations, United Nations agencies and a range of citizen opinion polls. According to MY World’s website, votes can be submitted online, and in some countries, by mobile phone or through offline ballots. Ms. Melamed added that organizers of the survey were also going out in a traditional way, on bikes and on foot, in certain remote areas, gathering information from people who do not have access to the Internet or mobile phones. As examples of civil society partnership, [Corinne Woods, Director of the United Nations Millennium Campaign] noted that boy scouts had been mobilized in several countries to spread the message and get people to connect and vote. In Nigeria, the Government was supporting many thousands in the national youth core as they visited villages to mobilize votes. Mass media companies such as Viacom, MTV, Nickelodeon, and BET were involved in a major online mobilization. Results from the survey will be shared with Mr. Ban, his High-level Panel on the Post-2015 Development Agenda, and world leaders. Yesterday, Mr. Ban met with four youth volunteers who are capturing communities’ development priorities and called on the public to make a difference on the issues that impact their lives the most. These inputs, along with those from across the UN system and beyond, including the outcomes of consultations going on worldwide and the voices of businesses, academia and the scientific community, will feed into the work of the Panel, which will present its report in May. So we know that The Report of the High-Level Panel of Eminent Persons on the Post-2015 Development Agenda was presented with much fanfare at the end of May; but I thought it would be interesting to see what the results of this “innovative initiative” might have been! When and where will this all happen? From now until 2015, we want as many people in as many countries as possible to be involved: citizens of all ages, genders and backgrounds, particularly the world’s poor and marginalized communities. MY World will be available from early December 2012, so countries hosting national consultations can take it into account. However, the global launch of MY World is scheduled for late January 2013 (at that time a comprehensive communication toolkit will be available for all). But in playing around with their interactive platform, I did notice that “A good education” consistently ranked in first place, followed by equally sensible choices. And “Action taken on climate change”, of course, for most parameters was 16th (or 15th). Cast your votes and spread the word, folks; so that we can keep “Action taken on climate change” where it belongs: off the table (or at least at the bottom of the priority heap)! It seems that U.K. Prime Minister, David Cameron (who was one of the three Co-chairs of the High Level Panel of Eminent Persons) may well have seen the writing on the virtual wall! PM David Cameron is determined to achieve change issues which are critical for growth, prosperity and economic development across the world. Britain and America have a proud history of working together to meet the great challenges of the day. Ours is a partnership without parallel, rooted in our values of freedom and enterprise – advancing not just Britain’s and America’s interests but the good of people around the world. Today, our greatest challenge is to restore strong and sustainable growth to the world economy. When times are tough, some want to put the barriers up, to look inwards, and to protect themselves from the world. But Britain and America stand for a better way. We have a precious opportunity to transform the global economy—not by less openness and less free trade, but by more. And we must do everything possible to seize it. If I interpret the results correctly ( after I voted) Climate Change came bottom in all age groups ,genders and for the world in general, except for the location where I live, where it came 5th. The UN really does intend to rule over all of us. Unfortunately few understand how much control they exert over mindsets and beliefs about AGW through the accreditation agencies. The ones who accredit school districts, private schools, and higher ed. When the UN can determine what are acceptable values, attitudes, and beliefs in the classroom and computer technology can record and track, the classroom is the new battleplace. As tablets replace textbooks, the extent of the indoctrination is hard to see. But the UN has put out report after report on using education to make objections to AGW moot. Pingback: It appears that by UN sponsored vote, the world just doesn’t care much about climate change | Watts Up With That? We unfortunately share a country that rates Climate Change Action higher than rock bottom. At the UN they say that we’re all (nominally) part of “civil society”, so on behalf of Mr Ban and the rest – thanks and congratulations, Hilary! As always I admire your use of word count to read between the lines; it’s rather like analysing Pravda in the old days. The rankings by HDI are interesting. “Action taken on climate change” comes up highest – although still not very high, overall – in the “Very High” category (developed world, as Brian H has mentioned), lower in the “High” category and rock bottom in the Medium and Low categories. We’re always being told that poorer nations are driving action on climate change, because they will bear the brunt of it, but, if this is any way a reliable indicator, they appear to have other priorities, when asked. Not sure how the pollsters will filter out people who decide to “vote early, vote often”, especially as the poll is going to remain open for over a year. The web page says “By ﬁlling this out, I pledge that this is my single vote in the MY World global survey. I will not vote more than once.” How much is that pledge worth, though? David Cameron’s “war on tax evasion/avoidance” comes across (to me, anyway) as a bid to claw back some popularity at home before the run up to the next election (he needs it!) This is another bandwagon, much as the “vote blue, go green” thing was, seven years ago. As Alex notes, it’s only in the high HDI countries, (and among the highly educated) that climate is seen as a problem. I suppose it’s because we’ve already got decent roads and health care, so the climate is one of the few things left to complain about. As always, the wording is incredibly sloppy. Why the choice betweeen a good education and better health care, and not the other way round? No, I don’t want a better education or better roads, thank you. But I do want them to be good. Still, It’s a worthy effort. I now know what’s worrying old ladies in Estonia. A surprising number of them answered the survey.